There is a growing awareness of the value of growing native Malibu plants for their hardiness and water efficiency. The Theodore Payne Foundation is a non-profit organization and valuable information source. Click to go to Theodore Payne page. Plant the seeds in a flat first. 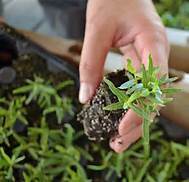 Put soil in flat, soak soil, sprinkle seeds on top of soil, cover seeds will light layer of dirt, mist top layer of soil. Keep moist but not too wet (damp) and in a few weeks you should have seedlings. When they sprout and have about 5-6 leaves on them you can transfer them to larger pots. When plants are 3-4 inches high, you can plant in ground. 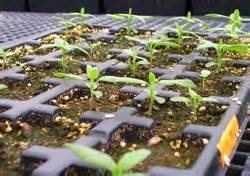 Filtered sunlight is best for starting plants from seed. When they are ready to go into the ground , they like a sunny spot or mostly sunny area. As for watering in ground , since they are a native plant they like water during the rainy season and little or no water in the dry season . With no rain, however, plants in the ground and in pots will need watering.